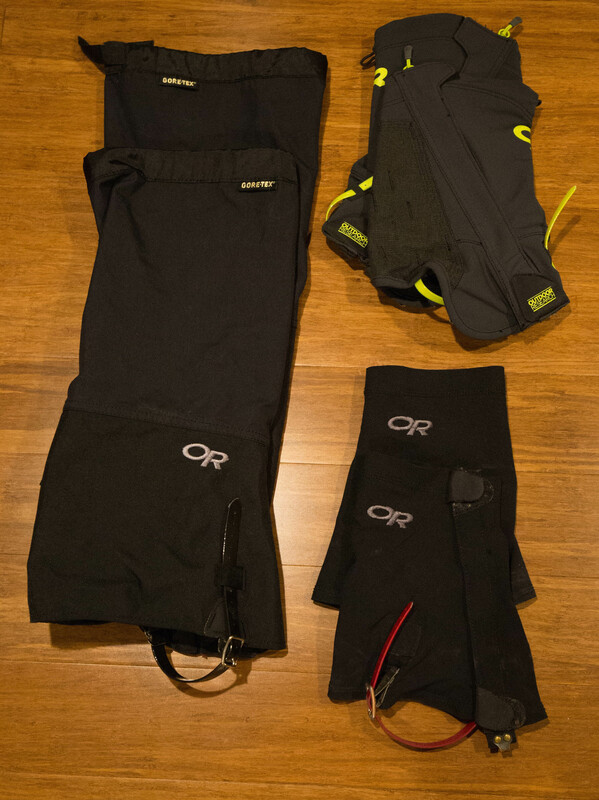 Thanks to my friend who works at Outdoor Research (OR), I’ve recently begun to acquire quite a few pieces from OR. Aside from my bias of knowing someone who works there (and getting the up and up on all the upcoming sales), I really like OR both for the products they put out and for their philosophy as a company. OR is one of the few remaining outdoor gear makers that still bases their operations out of the US (and from my home of Seattle no less). Their gear gets made all over, but all if it runs through their Seattle office before getting delivered to retails or directly to customers. On top of that, OR is a company that has remained focused on building gear for the outdoor adventurer (rather than trend towards stylish over usefulness). Luckily for Seattleites, wearing outdoor gear around the city is considered hip and in style. That being said, let’s get onto my OR gear and how I use it. Each of my five OR jackets is pictured above. The descriptions below move from left to right, beginning on the top row and then going to the bottom row. The first jacket is the Halogen Hoody™ (renamed the Cathode Hooded Jacket™). The Halogen/Cathode is my ascent jacket. The breathable soft-shell sides allow me to vent heat as I’m huffing and puffing up an early or windy alpine climb. I used this up Mount Daniel, and wore it almost the entire way up. It was a perfect combination for our pre-dawn start. 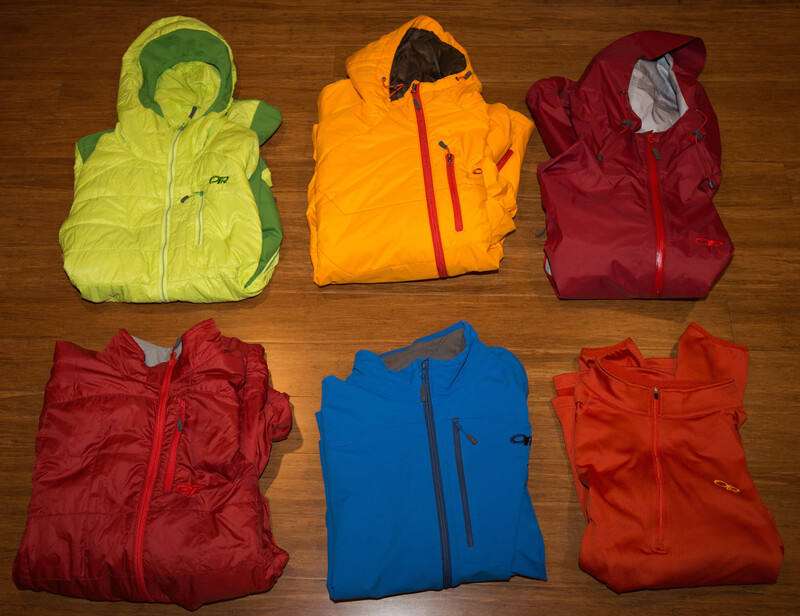 And at only 13 ounces, this jacket is easily packable. However, when the conditions do get colder, the soft-shell sides become a liability. That’s where the Neoplume Jacket™ comes in. Often my only jacket in the summer season, the Neoplume offers a strong warmth to weight ration. Where the Halogen and Havoc both have hoods, the Neoplume is hoodless, saving weight where I often do not need a hood, and bringing the Neoplume at a mere 15 ounces. In the summers, this jacket is for putting on in the mornings and evenings at camp or on windy peaks, saddles, and ridges. In the height of summer, I generally pull out a jacket only on occasion. The next jacket is the Paladin™, a rain shell. This jacket has been discontinued without a direct heir apparent. I asked my friend what she’d recommend as an equivalent in their current line, and she pointed to the Horizon Jacket™. This is my winter outer layer. During the summer and most of the shoulder season, you’ll find me with a 7 ounce poncho tarp for my rain gear, but when sliding around in the snow, a poncho just won’t do. Not to mention getting in the way when you need to pull out an ice axe for more technical work. At almost 1 pound, the Paladin is heavier than my poncho, especially given that you’ll need rain/snow pants to go with it. But, for the weight, you get a durable, comfortable, and versatile technical alpine shell. With pockets that don’t get in the way of harnesses and backpacks, and good pit zips to vent in warm rainy conditions, this jacket definitely pulls its weight. As the seasons get colder, sometimes a little more insulation is needed. In the shoulder season, I can sometimes get away with the Halogen and Neoplume together as a good layered system for the varying temperatures. However, on particularly cold trips, or in the winter, something more is often needed. Enter the Havoc Jacket™ (first on the bottom row). This jacket has the soul of a parka in the weight of an outdoor jacket. At 1 pound, 2 ounces, it’s the heaviest of my jackets, but it has kept me warm on cold winter nights. When combined with the Halogen or Neoplume, it can offer enough insulation even for the depth of winter here in the Pacific Northwest. My fifth OR jacket is the Cirque. Although I don’t regularly hike with this jacket, it is a favorite. Soft-shells are a great invention, and if I did not run so warm, I’m sure I would use them more. But my reality is, I simply cannot hike in them, even on most winter trips. However, my Cirque is my more casual around town and outdoor jacket. At 1 pound, 4.6 ounces, it’s heavier than the Havoc, but offers less insulation than the Halogen, which is the only reason I don’t bring it with me on trips. In fact, despite this, on shorter jaunts in the shoulder season, sometimes I do, because I like this jacket so much. But the reality is, it’s a luxury I cannot afford. But you better bet, it’s sitting waiting for me back in the car when I return from the hike. The final jacket is the Radiant LT Zip Top™. This fleece is not one I commonly bring on backpacking trips since my full zips are all lighter and easier to get on and off. Though this would be a perfectly acceptable piece of backpacking insulation, I just have some better options to go with. Nonetheless, this is a nice insulating layer for around the town, particularly for bicycling, since it’s more stretchy than the confining Cirque, and is not overly stuffy. Well before I knew anyone working at OR, I owned OR gaiters. This is, perhaps, where OR is best known for it’s quality. I currently have three pairs of gaiters, two of which are by OR: my full length gaiters and my mud gaiters. I also have a middle of the road gaiter, great for late Spring hiking where I might encounter some real snow, but not enough to warrant the full length ones. OR does not yet have this mid-sized gaiter. Pictured above you will see my old OR mud gaiters on the bottom right (which I’ve worn through), my new mud gaiters above them, and my full length gaiters on the left. My full length gaiters (Crocodiles™) I’ve had for a long time and could not tell you the particular model. They are my alpine and mountaineering gaiter, used for winter exploration, major peak bagging, and technical trips. These gaiters are well built and well designed and will likely continue to hold up for a long time. For mud gaiters, I use OR’s Endurance Gaiters™. I am often hiking with these. They are great for keeping grit out of my boots in all conditions. Although lately, I’ve taken to hiking without any gaiters, my hiking pants do a good job of covering and protecting the top of my boot. However, in days past, I used to wear mud gaiters on every hike. Now, I still bring them to protect in particularly muddy conditions or when I encounter small snow patches. They do the job of keeping snow and mud out of my boots when my pant legs do hike up. I’ve run through three or four different mud gaiters. They have a tendency to wear out, especially the soft shell style gaiters I’ve used in the past. However, these new gaiters from OR are particularly well built up with abrasion-resistant fabric in the inner and back leg, protecting the key areas where gaiters tend to wear. And, unlike my first pair of mud gaiters, which used a small cord under the boot, these have a solid leather strap that won’t wear down. Although a bit heavier than mud gaiters I’ve used in the past (at a little over 4 ounces), I think these may last me many years to come. The next category of OR products I have fit into gear organization. OR still makes the best backcountry organizer bag I’ve ever used. Pictured above you can see my original 10+ essentials and first aid bag, my newer 10+ essentials minus first aid bag, and a third organizational bag that I now use primarily for audio-video cables (rather than backpacking). I used to carry all my 10+ essentials and my first aid kit in a single OR bag that lasted me many years before literally splitting at the seams. Two interior pockets are quickly becoming a single interior pocket, so it sadly became time for retirement. It also had reached a point where my 10+ essentials kit was a brick, so I finally made the move and separated it from my first aid kit. I’ll go into more detail on my first aid kit and my 10+ essentials kit next week. But for now, I’ll just say that I highly recommend OR’s organizer bags. I down-sized from the #2 to the #1 with my split, but both sizes are quite effective. Up to this point, I’ve used a mix mash of gloves, but the hole forming in my go to backpacking glove’s ginger has spurred me into getting a true glove system. After consulting my friend for advice, I’ve decided to get the PL 100 Sensor Gloves™. This is about the right weight for the occasionally chilly weather I encounter in the shoulder seasons, and the 5% spandex helps give the gloves a smoother exterior than my old 100% fleece gloves (which tend to pick up dirt and grit in the backcountry). According to their website, these gloves weigh in at 2.1 ounces, about the same as my current aging gloves. Sadly, they were all out of the dusk color, so I went with the traditional black. For the shell, I decided to go with the slightly heavier Mt Baker Shell Mitts™. These, I’m told, fit quite well with the PL 100 gloves and the Gore-Tex® fabric will hold up to snowy alpine conditions. They come in at 5.4 ounces, giving a combined 7.5 ounce weight for the entire combo. Not bad for an alpine glove set. Although the Revel Shell Mitts™ come in lighter at only 3.5 ounces, if I’m bringing shells, I likely need the more robust and thicker mitts for protection and warmth. Both of these are still on order, so I’ll hold off on reviewing them until I’ve gotten them and had some time to try them out. Hats are another new entry point for me into the OR world. I’ve tried outdoor specific hats in the past, but have always ended up returning to regular old baseball caps with a pack towel or bandana for a cape in high alpine, exposed hikes. Although I would not have thought I’d end up being a hat with capes person, they tend to be the best option when backpacking. Wide brimmed hats get in the way of the pack, and when the sun is angled (which is a larger part of the day), they don’t give much protect. So, I decided to order and try out two of OR’s caped hats. The first is the Radar Sun Runner Cap™. I chose to get the khaki color of this one. Although not quite as interesting a color, it offers better light and heat reflection that the darker colors offered for this hat. The nice part of the Sun Runner is that the cape is completely removable. This is perfect for when the cape is not needed for a slightly less dorky look. The cape can be removed entirely or tucked into a pocket in the back of the hat. I really like the look of the Sun Runner, and I think this will likely be a hat I enjoy. Coming in at 2.6 ounces, it weighs a mere half ounce more than my current cap, and that’s not including the larger PackTowel I carry to cover my whole head and neck. The second is the ActiveIce Cap™. This cap is new to OR’s like, and according to their materials, is supposed to keep your skin cooler than if you weren’t wearing anything. Being a new product, my friend couldn’t speak to this from experience, but especially with the hot days we’ve had this summer, I was intrigued. Weighing 2.4 ounces, it is very comparable to the Sun Runner. I’m excited to get both and try them out.